If you haven’t checked your calendar lately, you should. Summer is right around the corner. How is your beach body coming along? You know - the one you promised to yourself, as part of your New Year Resolution list. I can tell by the look on your face (specifically, the pizza sauce stained dropped jaw) that you kind of forgot about it. What about mine you say? Well it’s getting there. It’s a lot better than last year; at least I don’t look like a beached whale anymore. After getting started, the most difficult part of losing weight is when you seem to hit a wall. You’re working hard and eating what you should, but your progress appears to have stalled. Before frustration sets in, it’s time to switch things up. If you’ve been working out on your own, perhaps you should look elsewhere for guidance. One of the Fitness Apps available at the CrackBerry App Store is FitDeck. With this app, your BlackBerry is now equipped to whip you into shape with numerous exercises. You can break out a workout anywhere. You’d better make sure your BlackBerry is in a water proof case; this one is going to make you sweat. The FitDeck Mobile application was developed by mobileXware LLC. The fitness exercises contained in FitDeck were developed by ACE-certified trainer, and former Navy SEAL instructor, Phil Black. The idea came from one of the co-founders, as they tried to develop a workout program in a remote Bolivian village, that had no exercise equipment – click here for the full story. mobileXware offers several versions of FitDeck, besides the one being reviewed; Stairs, Pilates and Office. FitDeck Mobile is available for most BlackBerrys, new or old (OS 4.0+). The current version is 1.6.7 and requires only 158.4KB. 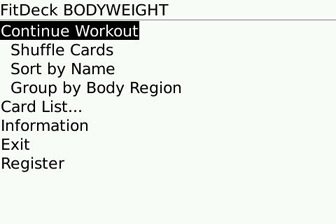 FitDeck Mobile consists of a deck of 46 flash cards of bodyweight exercises and 4 “wild cards”. These wild cards give information like: 30 second water break or repeat last card. Each card displays easy to understand diagrams of exercises, as well as step-by-step instructions. Levels of difficulty are defined by the repetition or time. For example- if you use the Push Ups card, the beginner, intermediate and advanced values are 8, 12, and 20 respectively. It’s too bad there isn’t a timer option available within FitDeck to remind you when to move on to the next exercise. The exercise cards are colour-coded to indicate which part of the body you are exercising; full, lower, middle and upper. I found it extremely easy to swoosh through each exercise card. Use your trackball/trackpad to scroll left and right between cards. The keypad also allows you to navigate through the exercise cards. Their exercise routines can be altered by shuffling the cards or focusing on a specific part of the body. I was happy to see that they also included stretching exercises for warming up and cooling down. For quick access to bodyweight exercises, FitDeck is definitely a great workout buddy. It’s truly fitness anytime anywhere, as no equipment is required; only your BlackBerry. You can pick up FitDeck mobile for $9.99 from the CrackBerry App Store. The price may not agree with everyone, but there is a free 3 day trial available to help you make your decision. The other FitDeck apps are available too and can be found here.